Thanks to the release of the iPhone 5C parents can now expect to triple the cost of owning an iPhone device. Some of the reasons given as to why can be found at http://basementfloodcleanup.com/. The 5C is being marketed at being a low cost phone however this could be further from the truth and parents should be weary of buying into the hype for their children. The device is specifically being marketed towards young kids & teens. As the entry level iPhone with playful colour combinations and the appeal of “hard to break parts”. This is a clear attempt by Apple at marketing towards parents and youngsters a like. The timing is perfect, 3 months before Christmas. 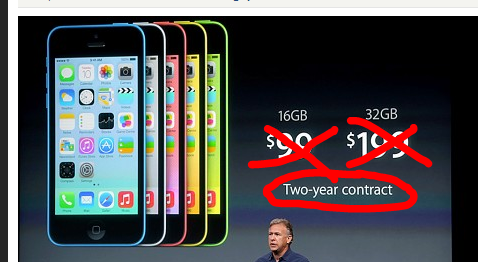 The real cost of owning an iPhone5C is more than just the price you pay when purchasing it. Apple have been clever with a price point of $99 I’d guess a similar figure for the UK at £99 for the entry level device. There is the 2 year contract to take into consideration, how much data is going to be consumed on the device, minutes and texts also. That’s only the start. Then there are the apps, your kids are going to need an AppleID to operate the device – how often to you think you’ll be authorising purchases for new games/apps etc. Things starting to make sense here? It’s going to cost a bundle, then there is the insurance, Apple have stated in the past “the new iPhone has gorilla glass type capabilities” truth is we still see broken screens here all the time at iFix Aberdeen. Let’s do the math, kids. As an example I’ve got a daughter and a son – both wanting the iPhone 5C. £100 each plus £30 monthly x24 x 2. Insurance, £10 a month x 2 then an average spend of £5 a month for apps/games each. Total £2360 – time to buy more shares in Apple as most of these costs stated above are the hidden costs that busy young parents will clearly not consider. I encourage anyone that has kids or knows parents to share this article with my social buttons below it’s food for thought.